Click on EXIT to return to the John Mason's Earth Sciences page. Click HERE to skip the notes and go straight down to the image gallery menu. Mining has taken place in Central Wales since Bronze Age times (for copper), with a recently-discovered smelting-site near Talybont providing evidence that the Romans worked lead in the area. Later mining was for lead and silver (Elizabethan and Civil War times) and zinc became important from the mid-19th century onwards. Modest amounts of marcasite and barium minerals have been produced locally and one mine has been looked at as a potential calcite resource. Mining ceased in the early 20th century, but much research has since been undertaken, with a host of unusual ore minerals being identified from the mid-1980s onwards. The Orefield is a polyphase mineralised terrain, in which the mineralisation is epigenetic vein-type and at least twelve episodes of fracturing and mineralisation, represented by successive crosscutting mineral assemblages, have been identified. The mineralisation is entirely hosted by Upper Ordovician to Lower Silurian clastic marine sediments. The veins are apparently all post-Acadian in age, with a range of Pb-Pb isotopic ages suggesting emplacement from Devonian through to Permian times. 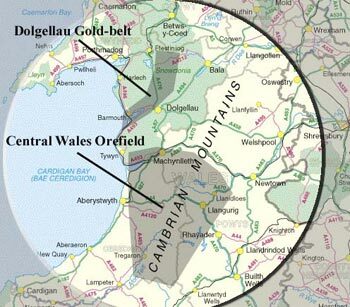 The mineralisation is very different from the pre-tectonic metallogenic province known as the Dolgellau Gold-belt, only a short distance to the north. The Gold-belt, however, is a mesothermal metamorphic gold-quartz vein province hosted by a highly altered suite of Cambrian sediments and intrusives (including some with porphyry-type Cu mineralisation): the paragenetic and alteration patterns are completely different and the veins themselves have, via Acadian deformation, been strongly folded, boudinaged and recrystallised. Back to Central Wales: in mineralogical terms, the veins are dominated by quartz with two major generations of carbonate, the early one being ferroan dolomite and the later one calcite. Baryte and witherite are late-stage components in the eastern part of the orefield. Fluorite is absent so far as we know. Sulphides are locally abundant and may form large masses or ribs. Galena and sphalerite are broadly speaking the most abundant, with lesser chalcopyrite and tetrahedrite and locally important marcasite. A wide range of accessory ore minerals, particularly cobalt and nickel-bearing species, occur in certain assemblages. The paragenetic determinations that allowed the sequence of emplacement of the assemblages to be determined (as set out in the table below) were based on observations of cross-cutting veins and rebrecciation. A frequent feature in Central Wales is to find one assemblage occurring in a vein cutting another, or to find one assemblage rebrecciated and cemented by another. In such cases it is straightforward to say that one came first, the other later. Moreover regional patterns, in which such observations repeat themselves time and again, tend to build up as more sites are studied. 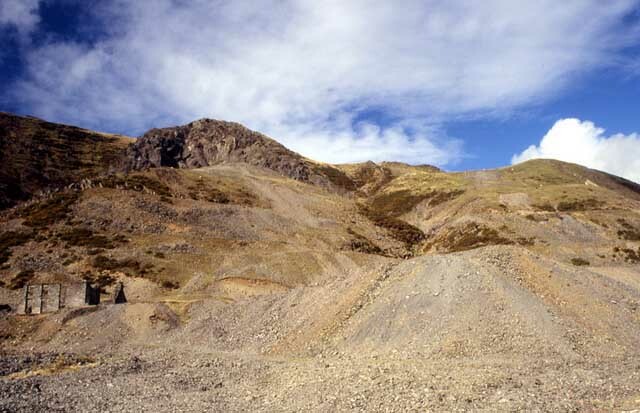 Above: a view of part of Cwmystwyth mine, one of the larger mines of Central Wales, where extraction of ores has intermittently occurred since the Bronze Age. Several of the twelve Central Wales mineral assemblages may be identified here. The twelve successive mineral assemblages I deduced in my MPhil research & later publications may conveniently be divided into Early (A1) and late (A2). The original terms ("early-complex" and "late-simple") I now utterly loathe and would discourage their use! The suggested ages are based on a lead isotope study using paragenetically selected galena samples collected in a joint piece of work with geochemists at the British Geological Survey in the late 1980s. The model isotopic ages were certainly consistent with the "paragenetic relative ages" of the assemblages. The paragenetically last Central Wales assemblage - the A2-f marcasite assemblage, has not been studied isotopically - no galena! If the Pb-Pb dates are correct - they date material up to the A2-C assemblage, which appears to be of Permian age - then it appears that mineralisaing events continued, perhaps into post-Permian times. Interestingly some of the later Central Wales assemblages with consistent Permian Pb-Pb dates are texturally very similar to the MVT assemblages of the UK Pennine Orefields, and evidence exposed at Ogmore in South Wales demonstrates conclusively that the hydrothermal activity responsible for the MVT deposits of South Wales continued at least into Lower Jurassic times. Above: Central Wales features, in addition to the more typical Pb-Zn-Cu ores, a number of unusual metalliferous minerals, and particularly several species containing nickel and cobalt. This is a sample, magnified x1.5, of pinkish grey metallic siegenite (Ni,Co)3S4 associated with brassy yellow chalcopyrite in quartz-cemented breccia. The table below gives details of the primary paragenesis. The assemblages are listed in order of deposition as are the minerals in each assemblage. Species underlined are major economic components, those in italic only occur in trace amounts; the rest are minor phases occurring at more than two localities. These commonly feature a high mineral species diversity and often have a fine grainsize, so that ore petrology is absolutely vital for their full paragenetic study. The most diverse stage, the A1-C assemblage, is very likely to yield more ore mineral species with further sampling and petrology. A1 assemblages typically occur as breccia-cements, in all cases featuring tough, compact milky quartz radially grown about rock clasts. Vugs carry elongated prismatic quartz crystals. Wall-rock alteration is not obvious in hand specimen. Those from which galenas have been analysed have yielded early Devonian Pb-Pb isotopic ages, and it is generally thought that they developed during post-Acadian relaxation. A1-a: Minor early Cu: this is rather localised in occurrence. Examples: Castell mine has more of this than most, and it is easier to spot there. A1-b: Early sphalerite assemblage: this was locally important. Examples: Castell and Erglodd mines: at the latter, it is rebrecciated and cemented by the A1-C assemblage, as it is at most mines. Castell reveals the "cleanest" material and was unusually rich. A1-c: Polymetallic assemblage: this widely developed assemblage has a great mineralogical diversity. Economically by far the most important of the A1 assemblages, it supported the silver-mining industry of the 16th-17th centuries, due to its locally significant argentiferous tetrahedrite component. Examples: Erglodd, Darren, Esgairhir, Eaglebrook, Brynyrafr mines: most occurrences are on the west side of the Plynlimon "dome" with relatively few to the east. 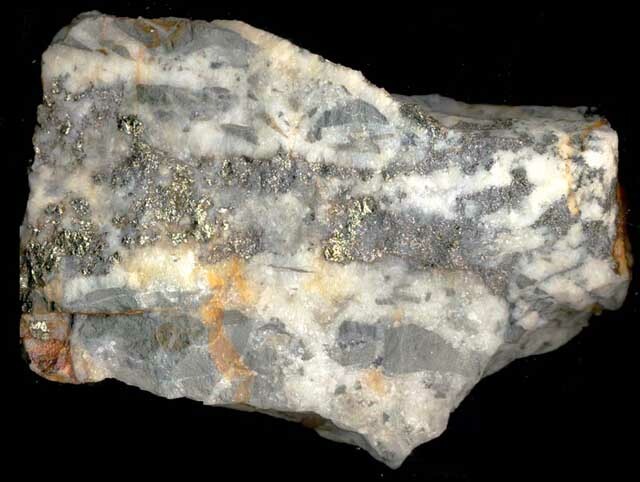 A1-d: Minor late veining, often cutting sheared sulphides e.g. "steel ore" galena. Of no economic importance. Examples: occurs at most mines where the A1-C assemblages are well-developed. A1-e: Ferroan dolomite influx - copious quantities of iron-bearing carbonate which cement rebrecciated A1-C and older material. A1-f: Late cavity-filling: widespread in minor to trace amounts - forms fracture-veins cutting ferroan dolomite too. Both breccia-cements and crustiform open-space fillings; the quartz is always glassy-white to clear and tends to be vuggy with squat, pyramidal crystals. Sulphides are coarse-grained and often inclusion-poor or inclusion-free. Wall-rock alteration is noticeable in A2-b, A2-d and A2-f assemblages where silicification has developed to a modest extent. Pb-Pb dating of some stages has given an early Carboniferous to Permian spread of isotopic ages: it is reasonable to suggest that these assemblages were deposited mainly during pre- and post-Variscan extension during basin development. A2-a: Major Pb-Zn assemblage: this was of major economic importance for large-tonnage orebodies with abundant galena and sphalerite. Silver values in lead concentrates were an order of magnitude below those of the A1-C assemblage. A2-b: Coarse-grained (to 10mm) ullmannite-bearing Pb-Cu assemblage. This was worked on a small scale locally where combined with the subsequent A2-C assemblage. It forms breccia-cements and composite veins in which the quartz and sulphides reveal a layered appearance. Ullmannite (not recognised by the miners) often overgrows idiomorphic galena epitaxially. Wall-rock very close to deposits of this assemblage is silicified in places. A2-c: Calcite-dominated assemblage: this tends to manifest itself as a crustiform-banded open fissure-fill as opposed to a breccia-cement, although it is sometimes found cementing shattered A2-b veinstone. Galena is coarse-grained, often occurring as large octahedral crystals. A2-d: Coarsely crystalline quartz: large (to 15cm), always well growth-zoned quartz crystals with dendritic iron sulphide and chalcopyrite inclusions. The original vugs that occurred in this assemblage - especially at Nantymwyn mine, must have been quite a sight! At Cefngwyn, the quartz overgrows A2-C calcite. A2-e: Barium minerals assemblage: breccia-cements and open fissure-fills, sometimes as masses occurring in uncemented fault-gouge, localised but large quantities of minerals where well-developed in the east of the Orefield. Examples: Bryntail, Penyclun, Gorn mines and an isolated trial to the W of Esgairhir. A2-f: Iron sulphides assemblage: this is widespread and locally occurs in major quantities causing post-mining environmental problems. At such localities it was worked for sulphuric acid production: at others it was an annoying contaminant, netveining earlier deposits of galena and sphalerite, which caused ore-dressing and smelting issues. This stage occurs as breccia cements, as cements to fault-gouge and as open-space crustiform fissure-fills. Silicification of wall-rock may be strong. The images in the menu above cover some of the more interesting ore minerals from Central Wales. For the uninitiated, apart from the breccias page, these images are taken through a high-power microscope which views the samples in reflected light. Each sample is a block of opaque ore minerals that has been painstakingly polished to an optical mirror-finish using diamond pastes down to 1 micron in size.